We offer a complete tennis training program and professional training program for all players (ATP, WTA, Juniors, Junior and Higher Trainees). All program and training plans are adapted to the needs of a particular player and they are drawn up after consulting our tennis coaches. The players taking part in tennis preparation in our Academy work in small teams (2 to 4 players) under the direction of one experienced tennis coach and other specialists (physical trainers, masseur, etc…). This personal access to each player makes possible his optimal training conditions for maximum development of his potential. Daily schedules are very intensive and ensures individual access to each player and his maximum performance grow. Basic program is intended for players of lower performance level in all age categories. It’s focused on improvement of technical skills and footwork on the court. Standard program is intended for players in all age categories playing national and international tournaments and have higher performance level. It’s focused on improvement all tennis skills (technical, tactical, mental, physical) and preparation for tournaments. 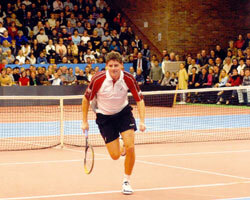 Profi program is mostly intended for players playing ATP, WTA and ITF tournaments. It’s focused on reaching maximum performance of player (mainly improvement tactical, mental and physical skills) and preparation for tournaments. Individual program is intended for players who wants to be here very short term (1- 4 days) or who aren’t satisfied with three previous programs. It’s drawn up on base assessment of player’s performance level (technical, tactical, mental qualities and physical skills) and player’s needs. The entrance assessment enable us to plan optimal program for improvement your weaknesses and development your strengths. The number of hours of tennis preparation depends on entrance assessment of player, his needs and agreement between player and coach. Each hour is paid separately according to the price list. Price lists are divided into the winter period 1.10.-19.4. and summer period 20.4.-30.9.